For such small insects, the impact that bees have on the natural world is massive. They pollinate roughly 65% of Australia’s food crops and, like canaries in a coalmine, are thought to be early warning systems about the ecological health of a region. Australia has both native and foreign bee populations; the European Honeybee, introduced roughly 190 years ago, forms the basis of our bee and honey industry but a large variety of our native bees also do their part in maintaining our agricultural industry. Now urban beekeeping and mindful gardening is the next step towards protecting the bee species both native and foreign that play such a vital role in our agriculture and environment. You might think that the best environment for bees is the country or the bush, away from cities and suburban locations. In fact, “city” bees can often be healthier than “rural” bees due to fewer pesticides and a larger variety of gardens and plants within their 10km foraging range. For keen gardeners and homeowners who don’t have the space or desire to keep bees but want to enjoy a buzzing garden as well as help a thriving bee population, it’s time to curate your garden for bees. Plant a variety of annually blooming fl owers, both native and foreign. Bees are particularly attracted to blue, purple, violet, white and yellow fl owers and the more shapes they come in, the better. Flowering vegetable and fruit plants also are very attractive to a foraging bee. A gorgeous garden full of blooms not only helps the population of city bees maintain biodiversity with a varied supply of nectar and pollen, it brings the calming infl uence of nature into your urban life. Even people in apartments can introduce greenery onto their balcony by maintaining planters of herbs or flowers. Bees also get thirsty so add a fresh water supply like a bird bath or water feature to keep the busy little workers hydrated – just make sure to include fl oating objects or pebbles raised above the surface to avoid the risk of them drowning. An interest in apiculture can have a wide variety of benefi ts beyond just delicious home-farmed honey. Become fascinated by bees and all of a sudden you’ll be researching seasonal trends in honey, what fl ora is native to your area, how you can grow the most bee-friendly garden, and who is selling locally harvested beeswax. 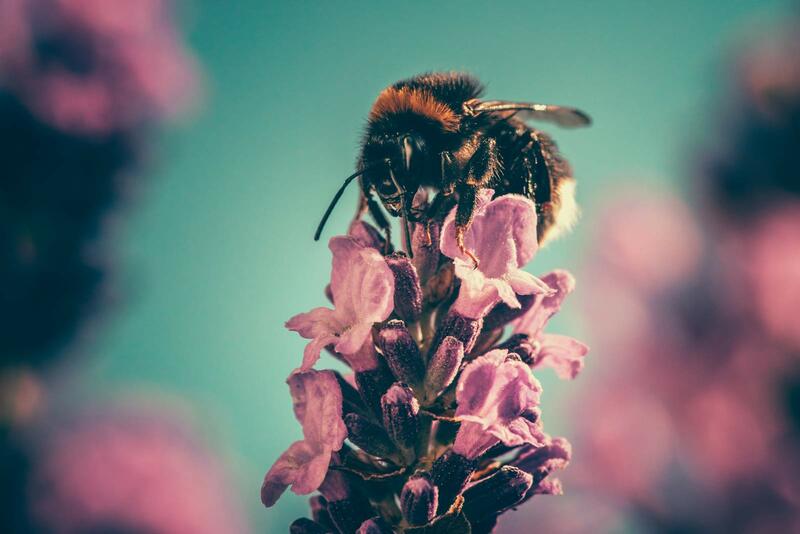 Once you’ve created a bee friendly environment, whether you’re keeping hives or you’ve designed your garden to help bees forage, you can truly enjoy the restful mindfulness that comes from making the cycles of nature part of your home. A gently humming garden feels alive and healthy and the soothing sound of bees flying from flower to flower is a gentle reminder of the natural world around us. Bees have been a part of human history for so long, it can’t be a surprise that we enjoy knowing that they are nearby going about their business.